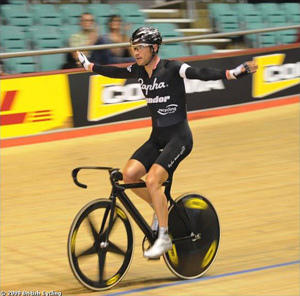 Points racing and team sprint were the two flavours cooked up on the fourth day of the National Track Championships. And Chris Newton was master-chef once more, giving another textbook demonstration of tactical guile and sheer speed. 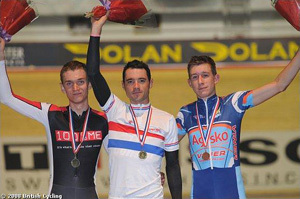 Chris Newton took his second national title of the championships, following his demolition job in the Scratch race. Newton looked assured throughout, his tactical nouse and silky style winning him sprint after sprint, controlling the race the way he knows best, from the front. Joseph Allen was the first to attack breaking away two laps before the first sprint to take top points, provoking an instant reaction from Chris Newton, clearly wanting to control things from the start and taking the 3 points for second place. 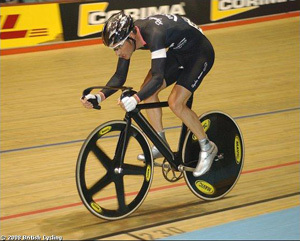 The second sprint was taken by Chris Newton, adding to his tally and putting him 2 points clear in the early stages. Rapha Condor's Lloyd led out the next sprint which was again taken by team-mate Newton stretching his lead to 7 points ahead of Evan's Cycles' Joseph Allen. Mark McNally took on the next sprint but Newton was glued to his tail, coming over the top to once again take top points, after which he kept piling on the pressure, splitting the field in two briefly before the pack reformed. The next sprint came and Newton again took the five points, once again splintering the field and stretching his lead to 15 points. Newton took top points in the next and took three riders away with him, Magnier, McNally and Mould. Magnier lost contact leaving just three. Newton took the five points and gained a lap along with Mould and McNally, seemingly with one hand on the National jersey at just half distance. Newton again went clear with McNally and Mould taking a further 20 points and making it essentially a three horse race, with Newton assured of the top spot, and McNally and Mould set for a ding dong battle for Silver. Newton continued to press home his advantage amassing further points and dragging McNally and Mould around to gain another lap. Magnier took top points at the 30 lap sprint, just pipping Newton, who immediately launched another attack, relentless, despite his commanding lead. Things were still tight between McNally and Mould, with Mould looking stronger than his opponent in the closing stages, taking maximum points with two sprints remaining, edging closer. However it would take a disaster for McNally to lose his second place. 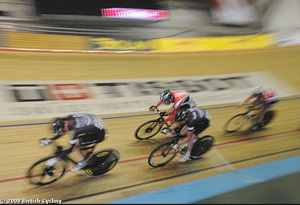 The penultimate sprint was taken by Mould, but McNally was in close attendance and limited his losses. McNally had done enough to secure silver, with Newton breaking clear of everyone to take the final sprint and an overwhelming victory.